I have bought Jeep Wranglers from Mike for years and have had no problems with them. They are honest and no hidden problems. 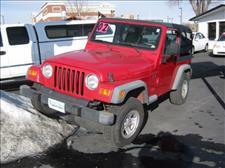 I am moving back to Colorado and I am going to buy another Wrangler from them. So if your in the market for a used car buy from them I always do. Bought a car over 2 years ago and still going strong, best deal in the Rockies, way better deal than anything in Wyoming were I'm from. My next used car I will be back. My dealings with Mike at North College Motors was not just easy , but pleasant as well. The initial verbal agreement was arrived at, to both our satisfaction and the rest of the transaction was as agreed, on time and done with the least demands possible on our time and efforts. We will be trading again, and out first stop and probably our last will be at North College Motors. Thanks Mike for being a man of your word and a new friend.